Electrochemical double layer capacitors, also known as supercapacitors or ultracapacitors, are energy storage elements with high energy density compared to conventional capacitors and high power density compared to batteries. Unlike conventional capacitors, where no chemical reactions is used and small amount of energy is stored by physically storing electric charges between two conductive plates upon application of an electric field, these electrochemical storage devices cross the boundary into battery technology by using special electrodes and electrolyte, and have capacitance values as high as 3500 Farads in a single standard case size with long cycle life (>100 000 cycles). Long life: It works for large number of cycle without wear and aging. Rapid charging: it takes a second to charge completely. Low cost: it is less expensive as compared to electrochemical battery. High power storage: It stores huge amount of energy in a small volume. Faster release: Release the energy much faster than battery. They have high self-discharge as compared to battery. Voltage balancing is required when more than three capacitors are connected in series. Supercapacitors offer a promising alternative approach to meeting the increasing power demands of energy storage systems and electronic devices. With their high power density, ability to perform in extreme temperatures, and millions of charge-recharge cycle capabilities, supercapacitors can increase circuit performance and prolong the life of batteries. This can add value to the end-product and ultimately reduce the costs to the customer by reducing the amount of batteries needed and the frequency of the replacement of the batteries, which adds greatly to the environmental friendliness of the end-product as well. 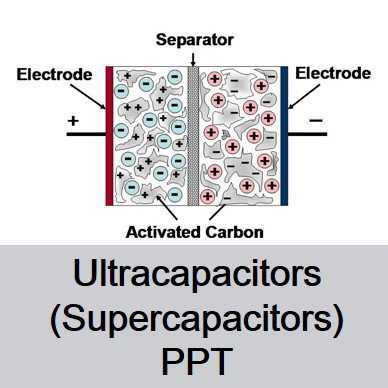 We have uploaded the Ultracapacitors (Supercapacitors) PPT Report with illustrated images.If you want to download the Ultracapacitors (Supercapacitors) PPT then simply click the link given below. 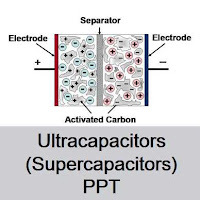 There is also given the preview and link of Ultracapacitors (Supercapacitors) PPT uploaded in YouTube. All the images used are copyright to the owners of the respective websites mentioned in the Ultracapacitors (Supercapacitors) PPT reference slide.